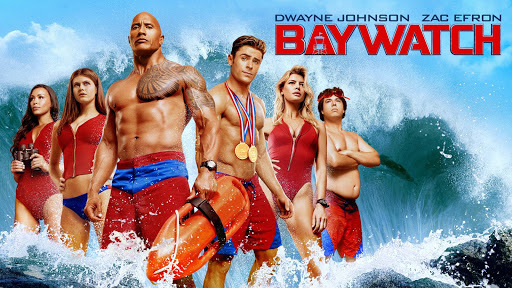 Baywatch (2017) is one of the latest attempts by a major movie studio to rely on name recognition of a past property in hopes that audiences will support the movie out of familiarity. Recent other attempts at the same thing have included CHiPs, 21 Jump Street and its sequel, 22 Jump Street. Often times, these movies have only the thinnest of connections with the awesome thing that they're "based" upon, which begs the question "who are these movies for?" Anyone who watched the TV shows that provide inspiration for these movies will be unhappy because they are so tonally different, and younger audiences who didn't grow up with those old TV shows won't care because they have no emotional investment. Baywatch bears almost no resemblance to the show that it takes its name from. Sure, there are very fit people in bikinis and tight trunks running on the beach, usually in slow motion. But that, along with a couple of character names, is the only connection to the show that was (and I think still is) the biggest success in the history of TV. I'm not even joking: TV's Baywatch aired in more markets and was watched by more people than any other show on television. Let's get something out of the way here. People say Baywatch was just about watching hot people wearing next to nothing. While there's no denying the jiggle factor, saying Baywatch was only about skin is like saying Walker: Texas Ranger was only about cowboy hats. While those things were always there, they weren't the focus of the show. Baywatch was a soap opera that would find the characters saving lives, stopping crime, and struggling with interpersonal relationships and personal issues on a weekly basis. The jiggle was just part of the scenery. Important scenery, sure, but never the focus.